This is the fifth in a series of videos culled from an interview about content marketing I did with Terry Foster of Cision Canada. Cision (the USA version) is also a sponsor of Convince & Convert and our Social Pros podcast. (here’s a post I wrote about their nifty content amplification tool). Terry: When talking about budgeting for content creation, should people put a lot of money into the one that they are going to be able to knock out of the park and that they are hoping goes viral, or just grinding out good content on a regular basis? Jay: Everybody wants the home run. That’s sort of the nature of business. But from a strategic standpoint, I’m a big proponent of the “more is better” approach. You’re better off having more trips, more at-bats, and stringing together a lot of base hits and doubles that eventually are going to succeed disproportionate to catching lightning in a bottle, because it’s really, really difficult to strategize for virality. Obviously, there are things you can to do maximize your chances that something jumps out of its container, but you can’t guarantee it. Viral is not a strategy. In some cases, it’s hope, and I’m not a big hope guy. Terry: What medium do you think works best when creating content? Is it video, the old printed word, a nice mix of the two? Even audio, should we be podcasting? Jay: I think podcasting is a huge opportunity and totally untapped in many cases, especially in B2B. I have a podcast called Social Pros. We’ve been doing it for a couple of years, which is actually been an enormous driver of my own business at Convince & Convert. I wouldn’t necessarily say that there is “a” medium that should be the one that you try, because it really depends on your customers. But, certainly from a trend standpoint, the trend towards visuals in inescapable. Everything that we see out there is now about pictures and video, whether it’s about Twitter – much more visual now with photos in line; Facebook of course; Google+ – very strong on photographs; obviously Instagram; Pinterest; infographics; SlideShare; YouTube; Instagram Video; Vine. Everything that people are paying attention to now fundamentally has pictures or video. As an author, it actually scares me to death, because Johnny don’t read any more. Johnny don’t want to read. Johnny wants to look at pictures. 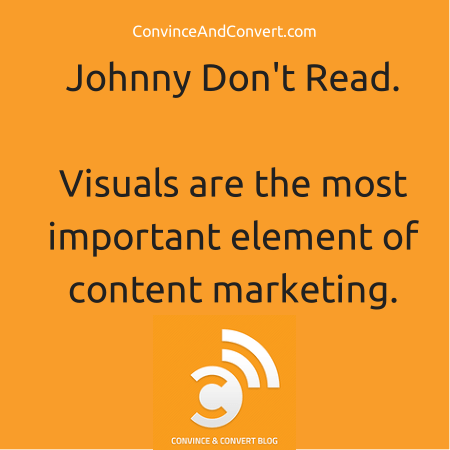 If your brand doesn’t have a visual content strategy, you better get one and fast.